Stephen Furst received first place for Smart Material Solutions, LLC. This story is a modified version of Poole College’s Lulu eGames winners present new tech applications, written by Anna Rzewnicki and published on the Poole College of Management website. Jenkins MBA program had a strong showing in the 2016 Lulu eGames entrepreneurship competition, with a total of 7 finalist teams, 2 third place, 2 second place and 1 first place winner during the final round held April 14. Most of the winning teams included technology entrepreneurship and commercialization students in the Jenkins MBA curriculum or received coaching through The Entrepreneurship Collaborative (TEC). In addition to the graduate teams, several Poole College of Management undergraduate teams posted wind, including two in the B Corps Champions Challenge, which was added to the eGames this year with support from The Business Sustainability Collaborative and local certified B Corporations Seventh Generation, The Redwoods Group, Murphy’s Naturals, and HQ Raleigh. “I congratulate all those who participated in the Lulu eGames this year,” said Ira Weiss, Poole College dean and Stephen P. Zelnak Jr. Chair. 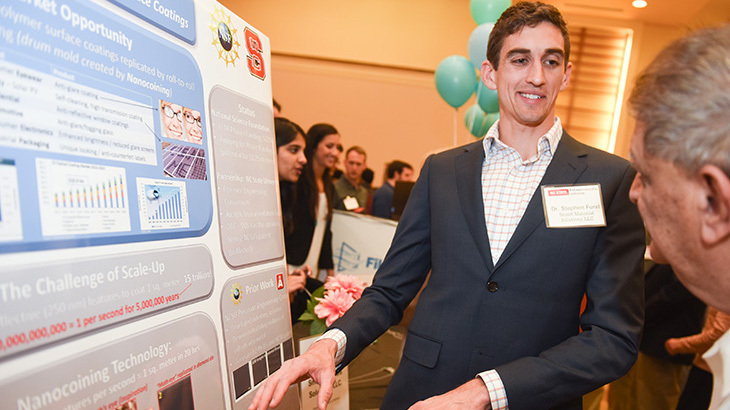 “Their entries reflect the strong entrepreneurial drive among students across the university and tremendous creativity in applying technology to bring new solutions to business, industry and society,” he said. This venture’s goal is to create industrial-scale cylindrical drum rolls coated with nanofeatures that can be used to roll miles of self-cleaning, anti-reflective film at low cost. This project utilizes proprietary web-based software developed at NC State that modulates novel ribosome dynamics during protein synthesis to address protein production needs in various life science industries. Custom Nano manufactures gold nano-rods (GNRs) in specific lengths and aspect ratios that have desirable surface plasmon resonances. This team tied for third place in this category with Insight Finder, Inc.
Adelphos Longboards combines Hewell’s appreciation for longboarding and art, and includes production of longboards that incorporates graphics and structural design. Additional recognition: Fan Favorite Video award. View his video pitch. SuperViZE is a group monitoring system that has been optimized for the caretakers of larger groups of children. It triangulates their relative locations for chaperones to view at any time and conduct automated roll calls. Existing child tracking devices are too slow, complex to use, or only effective for two to three children, so this team designed this device to not only be simple to use and quick to setup, but also to utilize a standard electromagnetic lock that’s so secure, even an adult would have difficulty removing it. MitoSPEED is a patent-pending process that combines existing molecular technologies in a novel and inventive way to allow food processors to verify food safety by measuring characteristics of the food’s mitochondrial DNA. The following three Poole College teams also made it to the eGames 2016 finals. Hi-LUM, which stands for High-speed Light Underwater Modem, was entered by Mysti Stewart and Zachary Williams, both Jenkins MBA students. Their venture aims to eliminate the need for complex oil surveying data infrastructure with the advent of high-speed wireless communication under water. PÜRE, a smart coffee roaster, grinder and brewer, was entered by Grahm Ransom and Pierre-Julien Marcella, Jenkins MBA students. See Waves: Blueprint was entered by Jeffrey Rawls, a senior in business management. His venture applies data analytics to measurements of sound’s physical properties, making the audible visible with eloquent and accurate graphical representations. The Lulu eGames is an annual startup competition managed by the Entrepreneurship Initiative at NC State University. More than 100 entries were submitted this year, five categories: New Venture Challenge; Design and Prototype; Arts Feasibility Study Challenge; B Corp Champions Challenge; and Daugherty Endowment Challenge. Of those, 33 made it to the finals and 15 were selected for first, second or third place. An additional 10 received Judges Choice and Fan Favorite Video recognition. Several of the team members provided feedback to Poole College Communications on their experience. Hewell said that he has had the concept for Adelphos Longboards on his mind since the summer of 2015, but the idea is rooted in his middle school years when he started skateboarding. The eGames competition provided a tangible way for Hewell to combine his classroom learning with the idea for this venture. “There are only so many times you can sit in Nelson 3400 before you go crazy – you have to put what you learn into practice. This opportunity was invaluable for my growth as an entrepreneur because transforming an idea into a business is easier said than done. Meeting strict deadlines pushed my time management skills; gaining market information on the local skateboard industry meant talking to real business owners; remembering my passion for the skate community helped me persevere through wanting to give up,” he said. “Ultimately, I have learned that pride comes before the downfall. Progress happened when I asked questions, and asking questions was crucial throughout every stage of the eGames competition. Shannon O’Shea, a first-year Jenkins MBA student in the entrepreneurship and technology commercialization concentration, explained how the MitoSPEED team came together and developed their business concept. “For the 576/577 course series (in the entrepreneurship and technology commercialization concentration) teams of MBA students and graduate level engineers choose technologies to evaluate and develop commercialization plans. Our team chose a DNA testing technology and have been evaluating its ability to serve the needs of the food processing market over the past two semesters,” O’Shea said. “We believe it could have significant impacts in improving food safety and reducing waste in food processing, so we entered in the B Corp Champions Challenge category. The B Corp model provides a blueprint for building our business and guidelines for how to measure our impacts. B Corp certification is uncommon in the biotech industry, so we believe it could be a differentiating factor,” she said. The competition process itself was valuable, O’Shea added. “We are required to practice presenting our business opportunity for class relatively often, but it was great to get experience practicing for a different audience that has never seen your idea before. New audiences always have great questions that make you think more deeply about your idea,” she said.